A 14 year project to recreate the lost tapestries of James V has been completed at Stirling Castle. The final tapestry in the series ‘The Mystic Hunt of the Unicorn’ woven by Master Weavers from West Dean Tapestry Studio was unveiled at Stirling Castle last week, marking the culmination of the biggest tapestry project undertaken in the United Kingdom in the last 100 years. The project was commissioned by Historic Scotland in 2001 as part of a wider project to restore the interiors of the palace of James V to how they may have looked in the 1540s, when it was home to James’ wife Mary of Guise and their young daughter, Mary, Queen of Scots. It was known from royal inventories that when James V built the palace he owned over 100 tapestries, but there is no record of what happened to them. 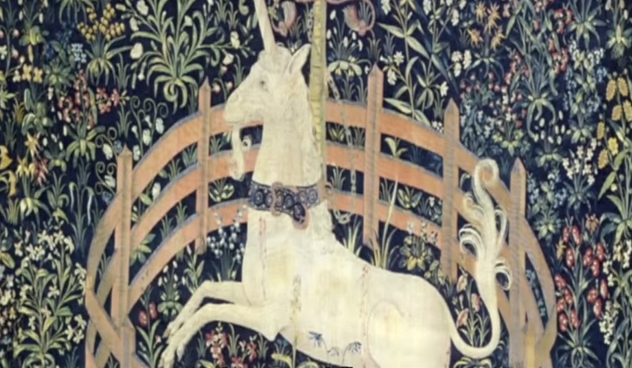 The inventories, however, described a set of tapestries depicting “the historie of the unicorne”. The team began extensive research which took them to the United States, and to the Metropolitan Museum of Art in New York, which is home to a set of seven 15th century Flemish tapestries ‘The Hunt of the Unicorn’. The result was a 14 year project to reinterpret and create the ‘Hunt of the Unicorn’ tapestries, bringing together 18 weavers from across the globe. Now for the first time visitors will be able to see all seven tapestries together, marking the final chapter in the journey to recreate the palace of James V.
Peter Buchanan, Project Manager for Historic Scotland, who oversaw the project from its inception to completion said, “It has been a privilege to watch these talented weavers painstakingly recreate the tapestries in all their Renaissance glory. Whilst we may never know what happened to the original tapestries, the fact that we now have these fantastic recreations, with the assistance of the Met in New York and through the generosity of our donors, will provide visitors to the castle now and for generations to come with a real insight into how the palace may have been at the time of James V.
The Stirling Tapestry project was funded through donations to the Historic Scotland Foundation. The main donor organisation was the Quinque Foundation of America, with contributions from many other organisations, friends of Historic Scotland and visitors to the Tapestry Studio at the Castle. Weaving was carried out by a team from West Dean Tapestry Studio, who were commissioned to design and weave all seven tapestries. Commenting on the completion of the project, Fiona Hyslop, Scotland’s Cabinet Secretary for Culture, Europe and External Affairs, added, “It’s wonderful that the Stirling Tapestry project has now been completed after more than a decade of hard work and painstaking research. Weaving took place both at West Dean, near Chichester and on site at a specially commissioned studio at the castle. The onsite weaving saw visitors return to the tapestry studio to watch the weaver’s progress over the duration of the project. The space has now been converted into a temporary exhibition, ‘Weaving The Unicorn,’ charting the weavers’ story. Ruth Jones, the last weaver to work on the project, commented, “It was fantastic to come on board as the 18th weaver on this unique project. Following in the footsteps of a medieval weaver has been a truly rewarding experience, and one that will stay with me for a long time. Recreating the last tapestry, the Mystic Hunt of the Unicorn, from just two fragments of the original tapestry was an artistic challenge like no other, and one that I am particularly proud of.